There’s a lot of demand for taking Tesla’s vehicles out for a spin. It took some time until H2-international was given an electric car for testing purposes and the experience only lasted one day. 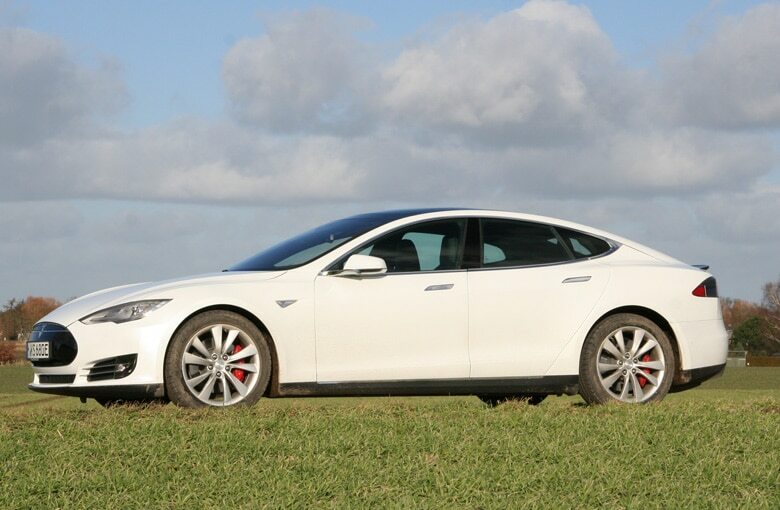 The 24 hours, however, were enough to see that the Model S takes the driving experience to an entirely new level. The car provided to us was a Model S P90D, which was driven across Germany from Düsseldorf to Berlin-Schönefeld and handed over there for our test drive by the charming Carla Felicia Gritz from Tesla Germany’s communications department. The Berlin service point of the US-based manufacturer is located in the middle of many undeveloped areas and in close vicinity to the Berlin-Brandenburg International airport, which is still under construction. It houses a repair shop, a store and one of the overall 53 superchargers found across Germany. Shortly after I arrived, the communications coordinator for the German-speaking region gave me a concise explanation of the technology and of all the car’s gadgets. She then presented me with the “key” – a somewhat misleading description, as it looked more like a thumb-size toy car without wheels. The remote control establishes contact with the car automatically as soon as the driver is only a few meters away from the vehicle. The turn signals flash, the door handles emerge, and the car is ready, although the mini-computer is still in your pants pocket. The interior of the vehicle boasts a large screen, which has replaced the radio in the middle console. It was obvious soon enough that almost all car applications are controlled by this touch screen: Whether it’s the seat heating for all five passengers or the sunroof, the entertainment system or even the headlights, for which I later tried to find a knob without any success. Everything runs through the computer, which also offers free wireless Internet access. The centralized control offers drivers fast access to various music databases (with comfortable selection by voice command) and even to movies while taking a break somewhere. It soon dawned on me that this might be the real “iPhone on wheels” (In 2012, Daimler’s head of R&D, Thomas Weber, described the then new A-Class that way). I paid really close attention when Gritz began talking about “autonomous driving,” although I was somewhat skeptical. To my knowledge, this was a technology under development, but possible insurance issues alone would push any implementation schedule back to the end of the decade. The Tesla expert, however, told me that she had let the car take over for almost all the way from Düsseldorf to Berlin. Halfway through the trip, the navigation system had suggested that she stop at a fast-charge station, where she could take some time to enjoy her coffee, and then she had approached Berlin quickly but without any rush. That might take some getting used to at first, she admitted, but you would get the hang of it very quickly. The car even changes lanes on its own. Wow! Now, I am truly impressed. Anyway, enough of the technical gimmicks: I wanted to get in and start driving. My eyes began to searchfor the start button, but I quickly remembered that the car had already been started. Carefully, I put down my foot on the accelerator pedal and the car worth EUR 145,000 (incl. all upgrades and VAT) began to move forward without making any noise. It soon became clear to me that Tesla had not designed a “compromise on wheels,” but a full-fledged sports car. The first attempts at acceleration made me aware what it meant to have a maximum power of 400 kW at your disposal. I couldn’t resist trying out the autopilot the first chance I got: on Berlin’s thruway. First, I was very cautious, but soon relaxed because the design was indeed working as intended: The cockpit shows all vehicles in front of and next to the Tesla car, as well as the road markings. However, a lot of traffic or winding roads will prompt the board computer to request that the driver take over at the wheel. Truly astonishing: Whereas others only talk about it, Tesla makes it happen – and it has my greatest admiration for that. Back home, I instantly took my kids and went with them on a test drive. The first few kilometers were enough to see that they were even more enamored with this model as they had been with the BMW i8 (see How Much Electric is in Hybrid?) – which, in fact, is “only” a hybrid version. Even at higher speeds, the P90D does just fine. Still, I didn’t feel like exceeding 200 kph, which to my surprise, the car arrives at pretty quickly. However, there was later another opportunity to get that adrenaline pumping: Gritz had shown me the car’s “blow your mind” mode that I only knew from YouTube. The setting was originally called “Insane” mode, but was renamed to “Ludicrous” and enables an even faster acceleration. So we stop on a deserted countryside road, select Ludicrous on the touch screen and start the countdown: Within 3.0 seconds, the electric all-wheel drive propels us to 100 kilometers per hour without the clutch smoking or the wheels spinning – despite a start on wet ground. Not bad! What’s especially reassuring during all these tryouts: There is virtually no so-called range anxiety with this 2.7-ton electric car. Range extender included, this model has a range of 505 kilometers (NEDC estimate). When I took back the Tesla the next day at moderate ambient temperatures, it still showed 160 kilometers of range left, despite the car displaying an average energy consumption of 266 Wh/km. How’s that possible? When I asked Gritz about it, she just pointed to the design of the vehicle: The sandwich structure at the underside of the car is completely filled out with battery cells (90 kWh, 700 kg, see figure above). A fast-charge point at direct current would allow the driver to charge half the battery within 20 minutes. In contrast, a full recharge at home would take around 30 hours. Else, the car only has a rear motor as well as a DC/DC converter (see figure). 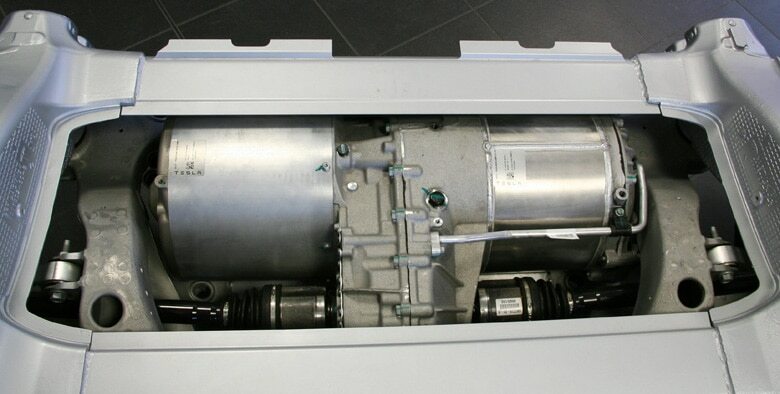 The Model S P90D (D = all-wheel drive dual motor) houses a second motor on the front axle. According to Elon Musk, who presented this engine in Los Angeles in October 2014, the structure allows for an optimal torque transfer to both axles within milliseconds. With the car having a power rated at 169 kW on the title, it also explains why there were no wheels spinning during our acceleration test in spite of the wet road and why the vehicle put on such an impressive performance. The simple chassis structure illustrates the crucial difference to conventional engines: This electric car has only 19 movable parts. Fuel or diesel cars have around 400. Such a “road show” begs the question why most other automotive manufacturers favor a design that limits the range and size of the car. Because of Tesla‘s continued success (more than 50,000 Model S produced last year, Best Cars 2016 award by the magazine Auto Motor & Sport), the mood seems to be shifting, albeit slowly. But whereas an increasing number of carmakers announce so-called “Tesla fighters,” which are thought to compete with the American models sometime in the future, the US-based manufacturer is mainly attempting to downsize: At the end of March 2016, Musk presented the less pricy Model 3, a Tesla car that ordinary citizens could afford and which should be on the market for EUR 35,000 at the end of next year. 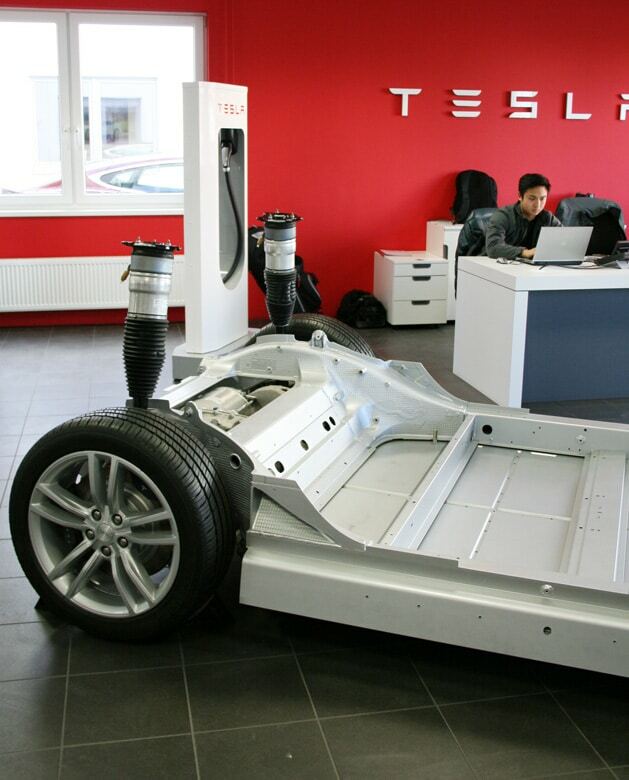 After Daimler – much like Toyota – had already sold its Tesla shares in October 2014, the German carmaker from the Swabian region cut ties with the US manufacturer this March. Harald Kröger, who oversees the electric car R&D activities at Mercedes-Benz told the magazine Automobilwoche. “We have had an excellent project with Tesla and a very good collaboration with our overseas colleagues. However, we currently have no plans for follow-up projects because we now have our own excellent supply base.” Tesla was Mercedes’ supplier of battery packs and powertrains for the electric version of the company’s B-Class.